ATTENTION: All of our dogs are in private foster homes. We do NOT have a kennel with multiple dogs. If you find a dog you want to meet in person, please go to www.secondchancedogrescue.org and complete an application. We will make every attempt to process all applications within 3 business days of receipt. 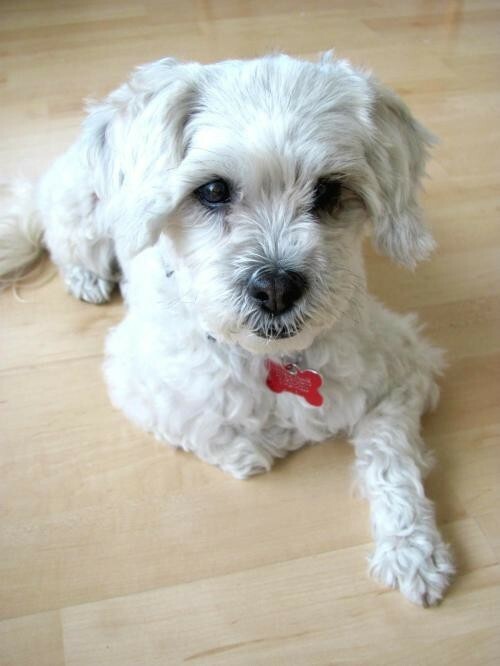 // // Daisie is an adorable 9 year old, 12 pound, Lhasa Apso/Shih Tzu mix. Daisie is primarily cream colored, and will need regular grooming to keep her looking spiffy. She is blind in both eyes but has no problem quickly learning her way around. She's completely potty trained and enjoys snuggling on the couch and playing with her toys. She is fantastic in the company of others, enjoys sunbathing and is a real easy going girl. She has been diagnosed with early kidney disease, but she is doing well with a special diet. She would do best in a family with a quieter, more sedate environment with no young children. Her adoption fee $100. All Second Chance Dog Rescue dogs are spayed/neutered, are up to date on vaccines and have microchips prior to adoption. Adoption fees vary depending on age of dog. Fees help Second Chance Dog Rescue cover spay/neuter costs, vaccinations, medical treatments, food and supplies. Please go to www.secondchancedogrescue.org and complete an application today! All dogs live in private foster homes until they are adopted. Second Chance Dog Rescue was formed to fulfill a desperate need in the community to Rescue, Rehabilitate & Re-home homeless dogs from the over-crowded local shelters, and from families who can no longer take care of their dogs (on a case-by-case basis only). Our program is based on foster care, and all rescued dogs spend their first days at a loving foster home where they receive personalized care. As part of our program, we ensure that all dogs are vaccinated, are spayed or neutered, and have been socialized by their foster family. In addition, Second Chance Dog Rescue provides support for potential new owners and monitors progress for both new pet parents and their adopted dogs. This helps guarantee that our dogs go to good, loving, forever homes. We require an Adoption Questionnaire to be completed - whether online or in person - before meeting any of our dogs. Upon approval of the Questionnaire, a potential adopter will be required to complete an Adoption Contract and pay adoption fees. All of our adoptions start with the first 2 weeks as a 'trial' period, to ensure the adoption is a good fit. Adoption of a puppy may require a refundable training deposit, which will be refunded upon completion of training with a Certfied dog trainer, and submission of certificate of completion to our office.